1) Busy conference calls can be hard to follow. Record, transcribe, review, and refer to later. The point is, these calls can be hard to follow. 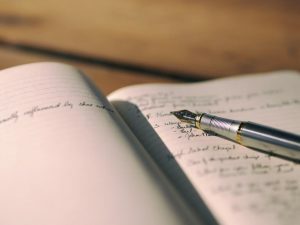 Callers often find themselves so consumed with jotting down notes and detailed instructions that they never find the opportunity to express their own thoughts. Mistakes may be made, projects may not meet expectations, small details could be overlooked. Luckily, FreeConference.com is here to help by offering Cue™ automated transcription as well as word-per-word transcription services for past recorded calls. No more stressing over misunderstandings, or missing crucial details for your big project. 2) Transcription will get all the details. If call recording alone just isn’t good enough, transcription services are also offered for past conference-calls. In addition to the Cue™ AI transcription notes feature standard on all paid plans, verbatim transcriptions can also be requested to make sure every word spoken during your past call is on record. Call recording transcription allows callers to focus on contributing to the discussion and voicing their opinions, and not having to worry about jotting down every important detail. They can instead rely on in-depth, organized transcripts available as early as the next day. Worried about not being about to take note of every single details of your meeting? Our Transcription team can help! Conference calls are not only meant to use tools like screen sharing but also to get everybody onto the same page, and utilizing these transcription services will ensure that all participants will have access to every essential detail. 3) Time Is Money: stop wasting time and transcribe your call recordings. Time is money, and FreeConference.com ensures that customers can save theirs through affordable transcription services. Some callers may not be able to attend the entirety of a conference, and may miss important information. Others may miss the call altogether, and have no way to review what they had missed. Transcripts can be provided to each member of the call, so they can review the discussion or catch-up on what was missed. These transcripts are designed with the customer in mind — some may need an in-depth document including Speaker ID; others may simply need notes from the conference. Regardless, FreeConference.com can fulfill anybody’s transcription needs. FreeConference.com offers conference call recording, affordable transcription services, web conferencing, and more. Accessed your meetings by phone, or any tablet, laptop, cellphone, or desktop with an internet connection. Now available with a subscription to any premium plan on FreeConference, automated transcription notes by Cue™ make it easier than ever to keep notes of your past calls—all you have to do is…well, nothing! Recorded calls are transcribed using AI technology and you are provided with a Smart Summary of your meeting after the call is over. The new Smart Search feature is available on all FreeConference accounts and makes it easy to find past conversation topics by searching for a topic or keyword.